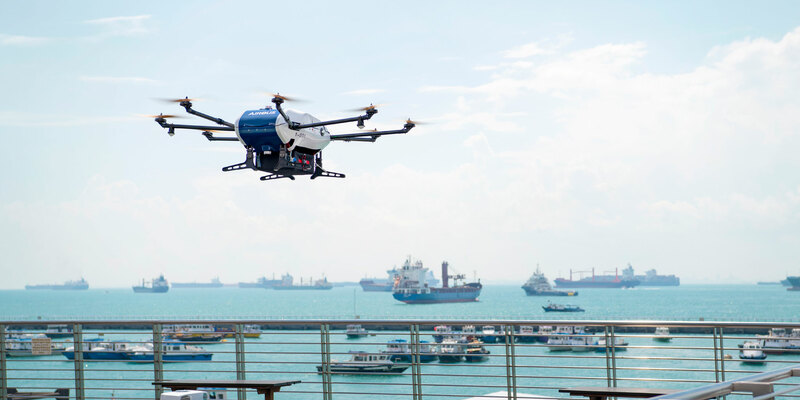 Airbus has launched shore-to-ship trials with its Skyways parcel delivery drone in Singapore, the first time drones have been flown in real port conditions to deliver time-critical maritime supplies to working vessels at anchorage. The first delivery was made 0.8 nm from the shoreline of Singapore’s Marina South Pier to the Swire Pacific Offshore’s anchor handling tug supply vessel M/V Pacific Centurion with a payload of 3.3 pounds of 3D-printed consumables. The roundtrip flight took less than 10 minutes. Skyways trials are being undertaken with partner Wilhelmsen Ships Services, which resupplies commercial vessels in ports with a fleet of launch boats. During the trials, the Skyways drone will lift off from the pier with a payload capability of up to 8.8 pounds and navigate autonomously along predetermined "aerial corridors" to vessels as far as 1.6 nm from the coast. Airbus and Wilhelmsen signed an agreement in June 2018 to develop an end-to-end unmanned aircraft system for safe shore-to-ship deliveries. A landing platform and control center were set up at the Marina South Pier in November 2018 through the facilitation of the Maritime and Port Authority of Singapore, which also designated anchorages for trial vessels. The Civil Aviation Authority of Singapore worked with Airbus and Wilhelmsen to ensure safety of the trials. “Modern technology such as the unmanned aircraft systems are just a new tool, albeit a very cool one, with which we can push our industry ever forward and improve how we serve our customers,” said Marius Johansen, v-p of commercial at Wilhelmsen Ships Services. Airbus noted that using drones in place of launch boats can slash delivery times by a factor of six, lower delivery costs by 90 percent, mitigate accident risks associated with the use of launch boats, and save energy. Airbus’s Skyways is an experimental project aimed at establishing seamless multi-modal transportation networks in smart cities. The company said it will soon begin another trial project, this one to deliver parcels autonomously in an urban environment with drones, at the National University of Singapore.